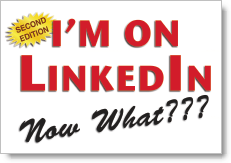 I’m on LinkedIn — Now What??? Second Edition … !!! Someone asked me to include a worksheet they could use to track their LinkedIn efforts. Here’s what we created… the page numbers coincide with the pages in the book. Please download this LinkedIn worksheet and feel free to share it with your friends! Wow, I am SO glad to have this submitted to the publisher so I can get on with the rest of my life! Actually, I’m very happy to have this second edition out, which is cleaner and of course more current than the first edition. As I was writing it it seemed like daily people would come back and say “make sure you include LinkedIn Applications,” “make sure you include LinkedIn Group Discussions,” “make sure you include LinkedIn Events,” etc. I was going crazy…! Alas, it’s done, and the LinkedIn ebook and paperback is available for purchase on the Happy About site, and Amazon might have it up as early as Friday (black friday). Thank you to everyone who has supported me in this process, leaving reviews on Amazon, emailing me, reading the LinkedIn blog, suggesting me as a speaker, etc. I am super-duper appreciative of YOU. Relationships, relationships, relationships! The key to short term and long term success (in many areas of our life) centers around relationships. Focus on real relationships with real human beings. The technology might change, but this idea doesn’t. LinkedIn is powerful. If you are not getting value out of LinkedIn, I’d seriously try and figure out what you are doing right and what you are doing wrong. I know many people are getting value out of LinkedIn, from many different industries. Go ahead and ignore it, but I’ll tell you, in professional business networking, LinkedIn is the 800 lb guerrilla and no one is going to displace them anytime soon. LinkedIn provides a great learning opportunity. Whether you want to see how to interact with other professionals online (or how not to), or you want to do industry or product research, LinkedIn is a terrific resource for more than “finding and being found.” Just go in and lurk in the LinkedIn Answers section and you might find some rich, helpful stuff to help you be better at what you do. I’d like to invite you to be an affiliate for my publisher, and get 30% of the purchase price for all books sold from his site. This is way better than Amazon’s 4%, and if your audience (blog, newsletter, etc.) could get value out of my book, sign up! Just go to http://www.happyabout.info/linkedinhelp.php and sign up in the upper right corner. The price for I’m on LinkedIn — Now What??? is $19.95 for the paperback and $11.95 for the ebook.